“In the course of singing these songs over the years Iâ€™ve probably altered them hugely from the way they came to me but I hope my informants wonâ€™t think them too much harmed. My thanks to them all anyway. However, dear listener, donâ€™t run away with the idea that I spend my time singing nothing but songs such as these. After all, I have always loved singing and sung all the songs that were available to me. So, off-duty at least, these songs mix with the songs of Crosby, Jolson, Paul Robeson and Hank Williams, to name only four of my favourite singers. The real gift that the folk revival has given me is the knowledge of these traditional songs so that they can share a place in my affections with the radio songs I had known for years. 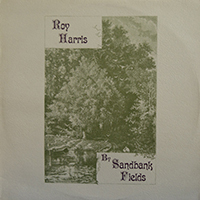 I hope you will enjoy the songs here; if you want to learn any to sing yourself – go ahead!” Roy Harris from the original album sleevenotes.